Z-selective oleﬁn metathesis is a particular challenge for the catalyst developers. This short review discusses the recent developments on the design of metathesis catalysts that facilitate the synthesis of di- or trisubstituted Z- or E-alkenes. The new catalysts found broad application in the synthesis of complex natural products as well as biologically active small molecules. The traditional cross metathesis reaction was extended to enantioselective, desymmetrizing, ring-opening/cross-metathesis (ROCM) reactions using the novel Mo-, W- or Ru complexes. Schrock and Hoveyda pioneered to develop the stereogenic-at-Mo (or –W)-monoaryloxide-pyrrolide (MAP) systems (1 and 2), while Grubbs and Hoveyda independently devised various stereogenic-at-Ru based systems (3 and 4). 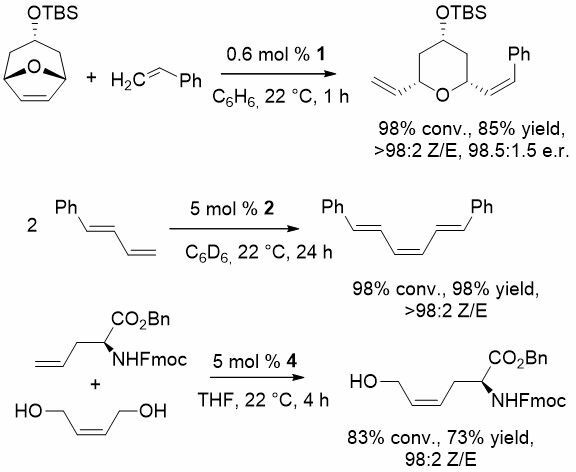 Z- selective enantioselective ROCM of bicyclic ring systems; homodimerisation of terminal alkenes and CM of terminal and internal alkenes are shown below as successful applications of the novel catalysts. Hoveyda, A. H. J. Org. Chem. 2014, 79, 4763. Herbert, M. B.; Grubbs, R. H. Angew. Chem., Int. Ed. 2015, 54, 5018. Flook, M. M.; Jiang, A. J.; Schrock, R. R.; Hoveyda, A. H. J. Am. Chem. Soc. 2009, 131, 7962. Jiang, A. J.; Zhao, Y.; Schrock, R. R.; Hoveyda, A. H. J. Am. Chem. Soc. 2009, 131, 16630. Keitz, B.K. ; Endo, K.; Patel, P. R.; Herbert, M. B.; Grubbs, R. H. J. Am. Chem. Soc. 2012, 134, 693. Koh, M. J.; Khan, R. K. M.; Torker, S.; Yu, M.; Mikus, M. S.; Hoveyda, A. H. Nature 2015, 517, 181. Ibrahem, I.; Yu, M.; Schrock, R. R.; Hoveyda, A. H. J. Am. Chem. Soc. 2009, 131, 3844. Townsend, E. M.; Schrock, R. R.; Hoveyda, A. H. J. Am. Chem. Soc. 2012, 134, 11334.
for Z-selective CM/macrocyclization (XiMoPac-W001, X639).